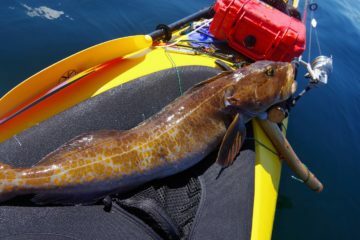 Kayak fishing is different from fishing in a boat in almost every way possible. 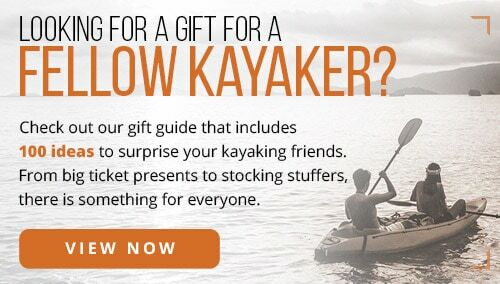 There is also more to consider than when simply paddling for recreation. 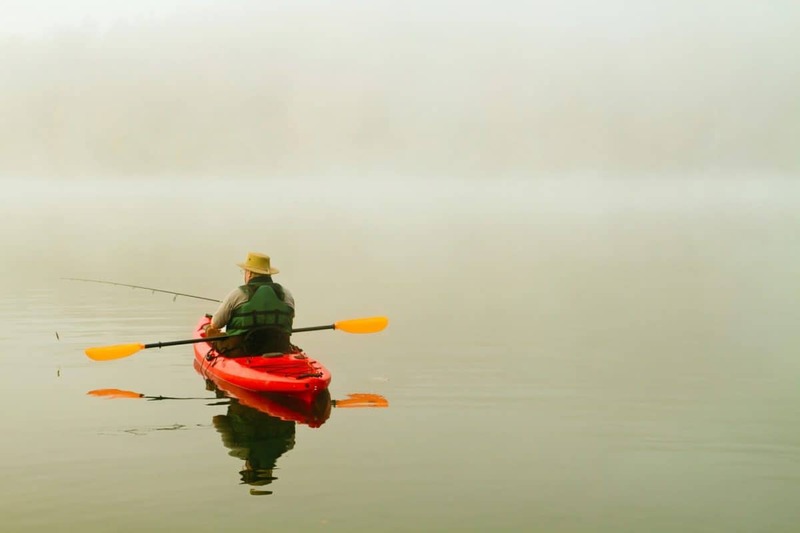 To ensure comfort, reduce strain and make your fishing day a success, it’s important to find the best kayak paddle for fishing. Here at The Adventure Junkies, we love helping people learn new outdoor sports and activities. 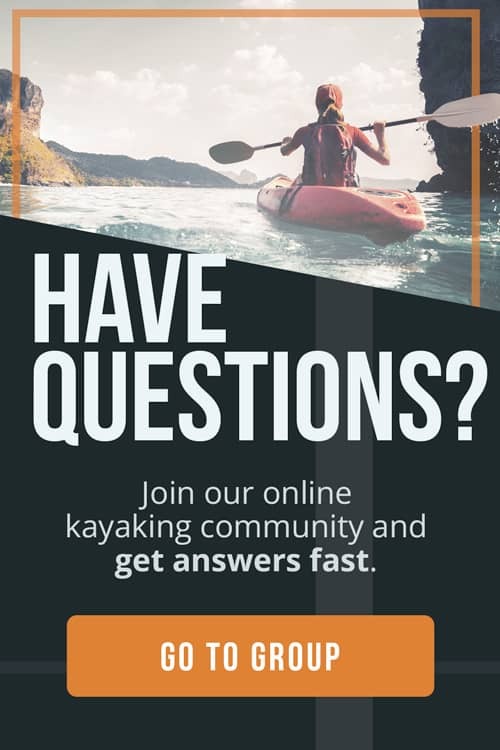 We offer a wide variety of guides and gear reviews, from fishing and kayaking to climbing and skiing. Follow this guide to find the best paddles for beginner and advanced fishermen at a range of price points. We’ve covered the basics of choosing a kayak paddle specific to the sport of kayak fishing. 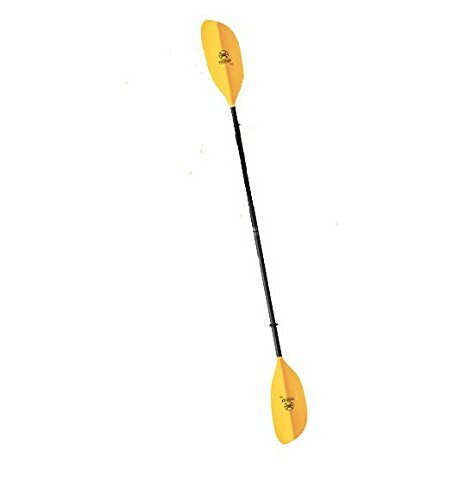 If you are completely new to kayaking and have never purchased a paddle before, we recommend understanding how to size a kayak paddle based on your body dimensions. There are two types of paddles you should be aware of. 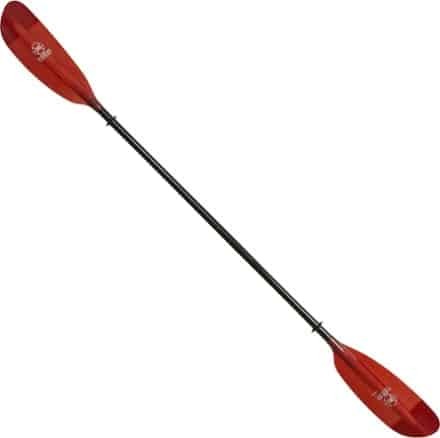 The first is called a high-angle paddle; users are known as high-angle paddlers. These paddles are shorter with wider blades. The user will keep the paddle quite perpendicular to the surface of the water, chopping into the lake or river with powerful strokes. 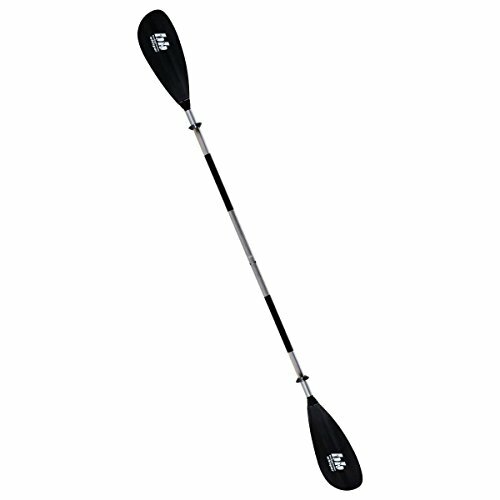 This type of paddle is best for whitewater kayaking, or paddlers who travel quickly. The other type of paddle is a low-angle paddle. These paddles are longer with thin blades. 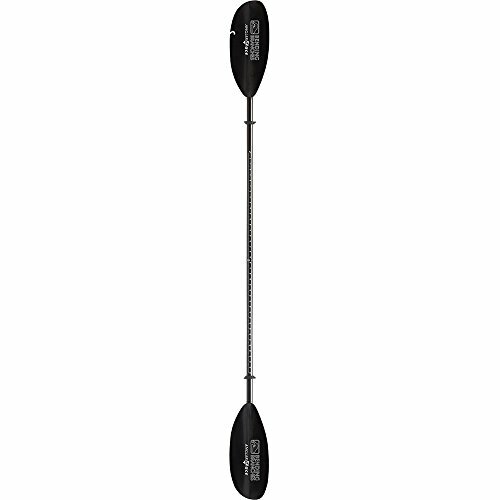 Low-angle paddlers hold the shaft of the paddle parallel to the water, calmly rotating their torso and arms side-to-side to make smooth, strong strokes. 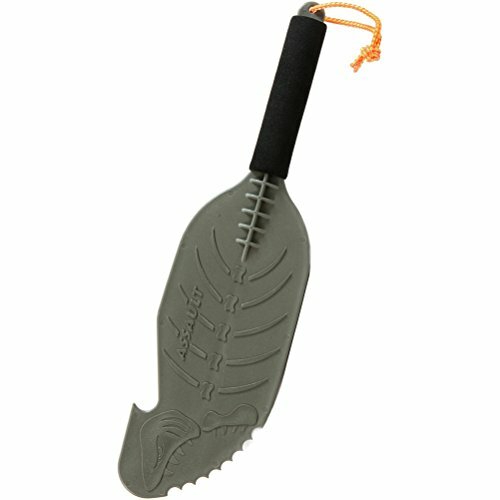 For kayak fishing, we highly recommend using a low-angle paddle. 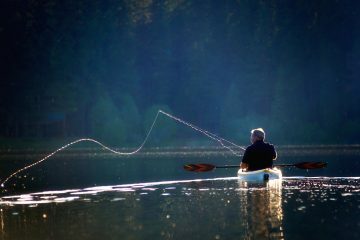 Fish are easily spooked, and it is really unnecessary on most bodies of water you’ll be fishing on to use a high-angle paddle. Regardless of the paddle you use, it’s important to know how to use it. 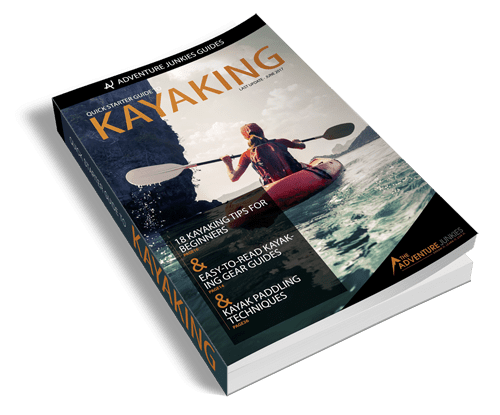 Read up on kayak paddling technique before you hit the water. As a fisherman, we’re sure you understand the difficulties that come about on a high-wind or breezy day. Just as it’s difficult to cast into the wind, it’s difficult to paddle into the wind. For this reason, many paddle manufacturers design their paddles to have adjustable feathering. Feathering describes the angle at which paddle blades are offset in relation to each other. 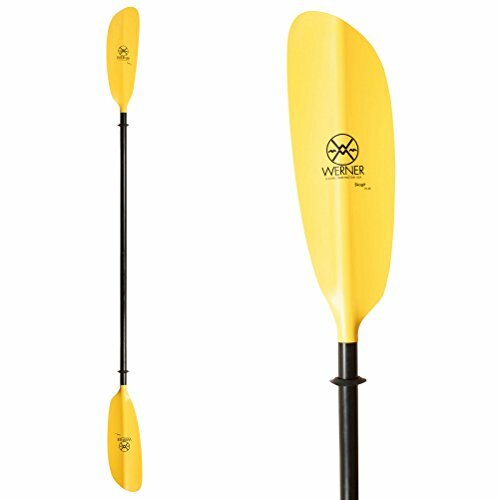 Having the ability to offset the blades from 0 to 60 degrees comes in handy when paddling into strong wind because two evenly set blades catch tons of air and make it difficult to paddle. On a day without wind, paddling with the blades set to the same angle is best. It’s easiest on the wrists, and there’s no wind to worry about. When it does get windy, simply press the ferrule and rotate the blades to the angle of your choosing. It is tougher on your wrists but can save you a lot of effort in reaching your destination. On your hunt for the best paddle, you’ll probably see many different configurations. Our favorite is the two-piece paddle. These paddles join in the center with a ferrule and can be broken down for transport. If you drive a car or an SUV, having the ability to break down a paddle to take up a smaller area is hugely important. In the event you drive a truck, one-piece paddles are fine to use and don’t impinge on space requirements, but also won’t offer adjustable feathering. Occasionally, you will come across four-piece paddles on the market which accommodate even smaller space requirements. But, two-piece paddles are generally the perfect size when disassembled. 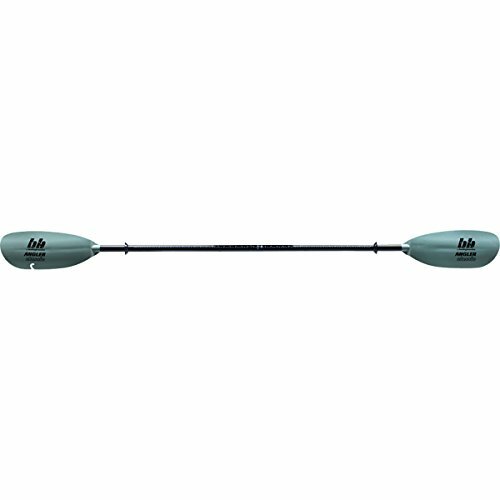 The shaft comprises the majority of the weight on any paddle. As with most gear, carbon fiber is the lightest and strongest option currently available. If you can afford a carbon fiber paddle, it’s your best bet. The lightweight build and durability cannot be topped. Second to pure carbon fiber is a carbon fiber blend. While not as lightweight and durable, these paddles are excellent choices ergonomically and economically. Fiberglass-reinforced nylon is another good option that’s widely used by kayak manufacturer. 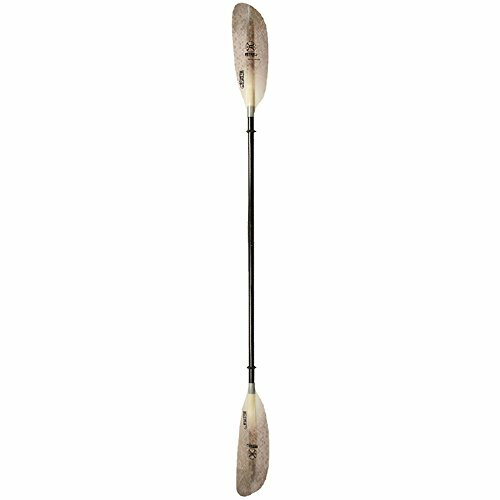 These paddles are lightweight and moderately strong, available at a medium price point. The last choices are fiberglass, aluminum, and polypropylene. If you’re just looking to get acquainted with the sport, don’t fret too much about the shaft material. There’s always room for an upgrade if you find you need a lighter paddle. 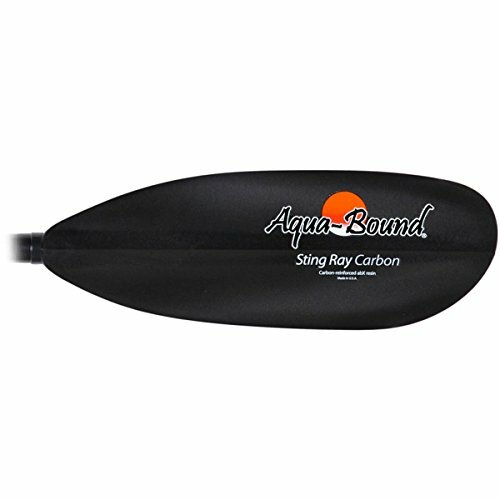 Fiberglass is the best option for kayak paddle blades. The fastest boats, touring kayaks, and stand-up paddle boards are all made of fiberglass on the exterior. This lightweight material cuts through water like a hot knife through butter. Other options are carbon-reinforced nylon, fiberglass-reinforced nylon or polypropylene, injection-molded resin, and polypropylene. 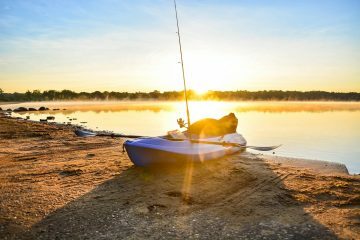 Consider the type of kayak fishing you’ll be doing when choosing blade material. If you’ll be encountering rocks, a strong carbon fiber blade is your best option. 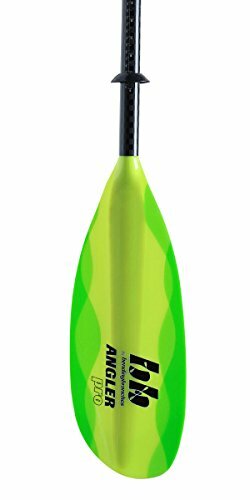 Fiberglass-reinforced nylon is great for beginner to intermediate kayak fisherman who will be mostly paddling on flatwater lakes, rivers and ocean. Resin and polypropylene aren’t the most lightweight options but are inexpensive and very durable.